“It’s a funny old business, going out your door”. Bilbo was definitely correct on that front, as I have always noticed how the little peculiarities make impressions on me almost as deep as the big sights and sounds of lands overseas. Perhaps it is because the travel books, blogs and documentaries so many of us love to read give such brilliant insights into what we can expect to experience while travelling that we are left to discover the smaller gems for ourselves. These gems are no less exciting, coming with the thrill of making a genuine discovery. These little curiosities make us laugh, smile, think and in my case inspire me to write an entire blog post on them. From the sound the pelican crossings emit when it safe for us to cross the road, the fact that I can go to the supermarket and buy white chocolate dipped Oreos or even that here one buys chickpeas in a jar rather than a tin. It is important to keep one’s eyes and ears open at all times to fully appreciate everything that is different when exploring somewhere new. So this post will focus on the little gems that I and my fellow Leonardo Project participants have discovered so far while living here in Seville. This city is famed for having more bars and cafés than any other in the world so surely it would be difficult for one to stand out above the rest. 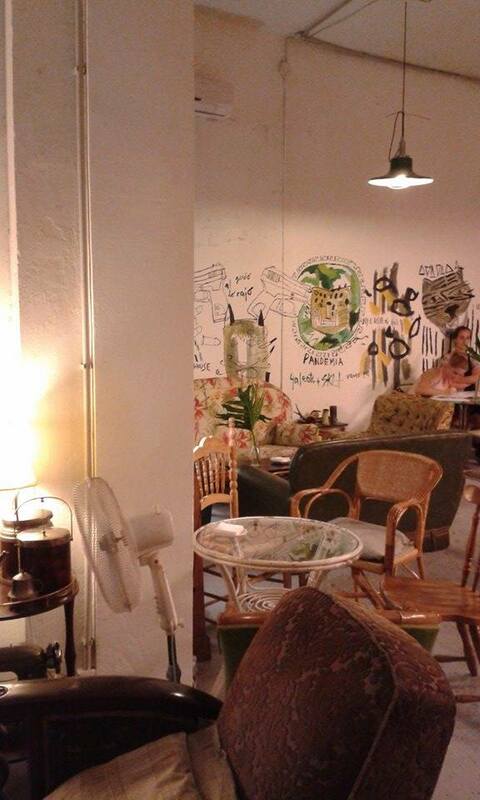 “Red House” art café does exactly this with its quirky décor, friendly staff and delicious food. Red House collaborates with local artists, musicians, poets, comedians and more to create a packed roster of events as well as a venue is simply wonderful to spend time in. As a vegetarian living in Spain it is rare for me to be spoilt for choice when looking through a menu, which here I was – another testament to Red House’s status as a hidden gem. Though Seville (understandably) presents its rich history to the world in order to attract visitors, it is a city whose contemporary artistic culture is just as important. Halloween night saw us visit Rompemoldes (which translates to break the mould), an artists’ residence just outside the historic centre. This small complex of apartments and studios hosts a wealth of talented artists who apply to occupy a studio along with the apartment above it. Two of my friends here were working at a family craft and live music event, which had a warm and cosy atmosphere despite the somewhat disturbing images used by the band’s visualiser. Rompemoldes is the kind of place that could be exclusive and bankrupting to live in but Seville has seen the importance of contemporary art and craft – and awards the residencies based on the creativity of the applicant, rather than the size of their wallet. It’s the little sights and sounds we notice that make places unique, as well as the big things we travel there for in the first place. Taking that one left turn instead of heading straight to your destination could unveil something truly magical, whether it’s a cosy café or beautiful building. Next week my writing will focus on something less hidden. Flamenco takes up a third of the title for this blog and much of my time here in Seville. In my next post I will do my best to introduce you to it and what I have been working on here – apologies to anyone who thought I had become a dancer. In the meantime, I’m off gem hunting.